Count me in! I have a black 1956 Super 88 four door sedan that is a well maintained survivor type car. Currently unavailable for picture due being away from home getting some front suspension work done. I saw them. I have my favorites, but any one of them would look fantastic! So good to add you to the list! 1955 Holiday 88 four door with lots of mods. I like em all, but i just happened to end up with a 56! Mark davis.......mayfield, ky. Yes. '55 two door sedan project. 56 2dr Holiday, installed 455, Turbo 400 and 9" rear end, love this car! Hopefully you're all familiar with Rocketfest? Have I seen this car? Is it blue & white? I have a 56 Holiday 4door HT. She is a beast now, but I hope to have her rocking by next summer. How do you all feel about engine swaps? I am planning on a 5.3 or 6.0 out of a 07-2010 Chevy Truck. It runs great right now, but I really like the idea of this being my daily driver. I also plan to swap out to 4 wheel disks. I'm just doing a ton of research and cleaning right now. Any Advice? Welcome to the fray! I have strong feelings both ways regarding engine swaps. I like having things as they were. I'd rather preserve the original car and use something else for daily transportation. That said, I also know what it takes to find and pay for parts for the original 324. If it's going to be a daily driver on today's highways, as much as I hate to admit it, it makes good economic and safety sense to swap to a SBC. And, it'll stop a lot more reliably with modern brakes, too. Just my opinion, fellas. What is the latest tally by year? What do we do now. Maybe we need a place to post pictures for everybody. Craigslist ad. May not be the right forum, but I'm thinking your the guys who'd be most interested. Tons of good parts. FOR SALE: 1956 Oldsmobile 98 Holiday 4 door I'm asking $875 or best offer. This 1956 Oldsmobile 98 Holiday 4 door has a 324 V-8 (5.3 L)(Rocket Olds) engine is complete, 4 barrel carburetor, dual exhaust, Jet-away Hydromatic automatic transmission, power brakes, power seat, power steering, power windows, The headliner has no rips or tears, It is in excellent condition, padded dash with autronic eye (the padded dash has no holes, cracks, or rips, it is in excellent condition), the dash board is complete and in excellent condition, the mileage is 91,226 original miles on the odometer. This car is all original, matching numbers and is complete and the body is very straight. It needs work and is rusty, windshield is cracked, passenger vent glass is broke, passenger door window is cracked, I also have 4 original hubcaps. It does run (ran when parked), it also has a non-op on it, I got this car and had planned on fixing it up, I can't afford to fix it up because of my finances and financial situation. The pics are of the 1956 Oldsmobile 98 4 door, any parts that are missing from the car in the pics are inside the car. I'm located in Manila and I'm asking $875 or best offer for the 1956 Oldsmobile 98 4 door. you can reply to this ad or you can text or call me at 707-599-7843. 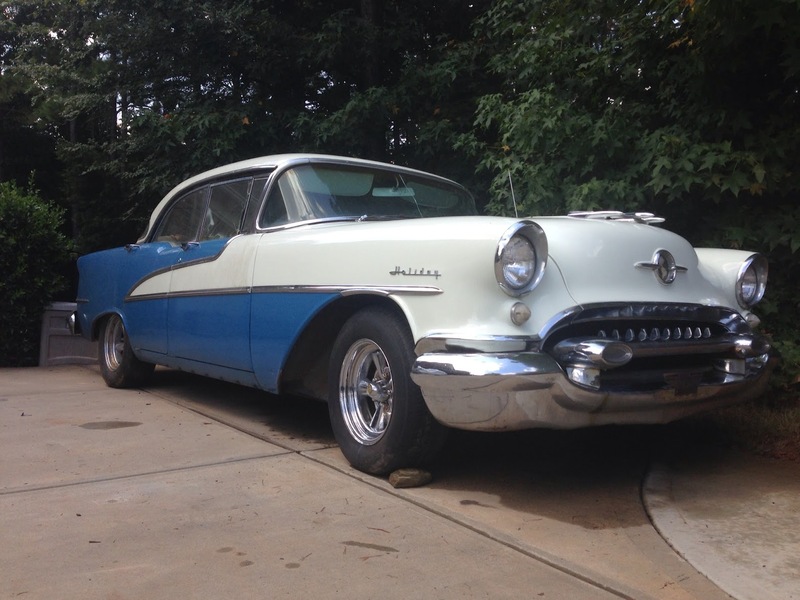 This 1956 Oldsmobile is all original. Thank you for taking a look at my ad and have a nice day. I do have paperwork and the keys. This car does have potential. This ad will remain up until I sell this car. I have done the research on this car, where it was built and what dealership it went to. If you want to take a look at this car you can call or text me at 707-599-7843. Thank you. 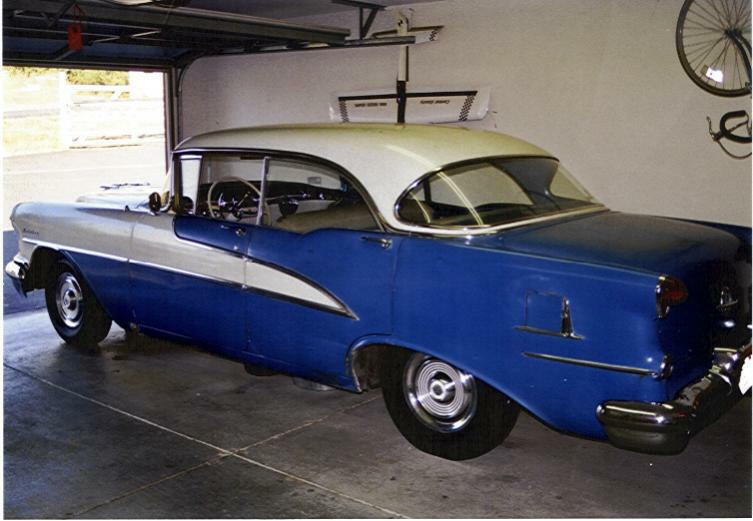 Just received a "55 Super, Friday Aug. 15Th, 2013. Slant pan hydro, but no power steering. Will need parts for conversion to PS. Any help appreciated. My first 55 was purchased in 1966. Due to circumstances beyond my control, I was not able to keep it for life. It will always be my favorite car. The "new" 55 runs a little rough, but I believe that can be tuned out. Hydro chirps the tires on full throttle shifts and shifts smoothly when it should. Has some rust starting, but not serious. NEEDS SHOCKS: any good recommendations? My first one had Moogs. Don't even know if they are still in business. Car has radials and needs power steering. Never thought I would own a REAL car again, but a VERY GOOD friend gave it to me as a gift. Need all the help I can get with finding parts. Back in the 60's, I bought 10 slant pan hydros for parts, giving $50 for the lot. Scrap price at the time. Thought it would give me a lifetime supply of parts. Wish I had all of them back now. I did build one good one for a friends 56 Olds to replace his failed Jetaway. That was a real learning experience as the 56 324 is nothing like the 55 324. The 56 was externally balanced; the 55 was not. Hello, kirkwoodken! Welcome back to the '55 crowd. What body style do you have? Got pictures? I played around with a '55 when I was 14-15 years old. I've always had a soft spot for them since. I have an extra slant pan sitting in the garage and I know where I can scoop up another quickly. It's always good to have those things in the back of your mind, just in case. I figure as long as I have a spare, ours will never fail. As soon as I get rid of it... Well, you know. Have fun with the '55! One of mine is a 1955 88. I've known it since it was new. Love the post-free look! Thanks for posting the pic! P.S. I'm the 4th Owner Since New.Upholstery Is 100 Percent Original.Chrome Has Never Been Re-chromed, And Car Still Has original Lacquer On Trunk and Right Side Of green. New guy here, but not for long! Right now the interior is a basket case, but soon she will be cruisin.